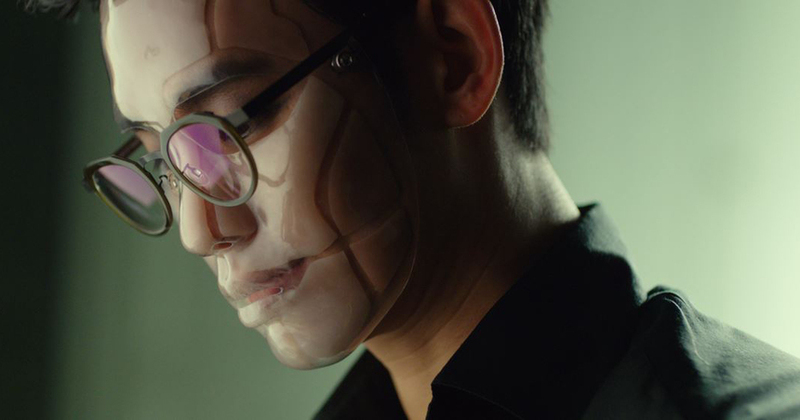 Kim Soo-hyun stars in one of the most singular Korean films to emerge in years, directed by Love Lee. In the same week that a new release has been embraced by the media (Bong Joon-ho's Okja), another has been making headlines for all the wrong reasons. So strong has the vitriol been for Real, a vehicle for Asian superstar heartthrob Kim Soo-hyun (Secretly Greatly), that lambasting it on social media has quickly turned into a sport. Scatological references aside, the gist is that this is one of, if not 'the', worst Korean films of all time. Stepping outside of your comfort zone can be a scary thing but this new action-noir (a label that couldn't begin to do it justice) has forced viewers into a completely alien cinematic experience, awash with reds, purples and strange masks, which most simply weren't prepared for. In a fictionalized Seoul teeming with crime, Tae-young is a skillful and ruthless problem solver who has built a flashy casino. Sessions with a psychiatrist steer him on to a mysterious path, where he goes head-to-head against a masked journalist who may be his doppelgänger and a crime boss who wants a cut of his gambling business. At least, that's what I think happens. Frankly, much of the raging criticism that Real has received has some justification. The film is terribly long, wildly sexist and almost incomprehensible, yet when the lights came on, rather than angry I felt exhilarated. Whether the result of careful calculation or sheer folly, this is one of the most singular Korean films to emerge in years. Over 137 minutes, the story is broken into three chapters: the intriguing 'Birth', the confounding 'VS. ', and the utterly bananas 'Real', when the tenuous threads of logic are ripped off once-and-for-all for a thrilling and camp finale. Mostly taking place in large spaces with sparse decoration (and even fewer characters), Real is cobbled together with slick images that at times have the same disembodied feel of a music video or commercial. Strikingly composed wide shots coexist with an army of closeups of Kim Soo-hyun, as every inch of his face and body is relentlessly pored over. Sadly, this voyeurism takes a dark turn when the camera is trained on the women of the narrative, who are often violently fetishized and whose characters' existences are solely defined by their shape and willingness in the eyes of lustful men. Ostensibly a stylized character study, which revolves around a conscious case of split personalities, Real wears its ambitions (pretensions?) on its sleeve. The vast majority takes place at night, giving the tale the aura of a waking dream as the film begins to up the weird quotient. When the story finally makes way for action, we discover that the limitations of physics are no match for Kim Soo-hyun's fists, which can knock out any opponent with a single blow and the sound of a thunder clap. Real marks the directorial debut of Kim Soo-hyun's cousin Love Lee (seriously), who replaced the original director and writer Lee Jung-seob at some point during filming and who also runs the production company behind the very expensive project. Regardless of his unfathomable intentions, he's managed to craft something remarkable that sears itself into memory with its singular vision, structure and logic be damned. As for Kim, he throws himself tooth and nail into his characters and when both are on screen (which is often), the effect is slightly surreal. Veterans Lee Sung-min (Broken), Sung Dong-il (Miss Granny) and Lee Kyoung-young (Inside Men) offer reliable support, even if their roles aren't always clear, and former f(x) member Sully (The Pirates) does her best in a thankless role that amounts to little more than eye candy. If you can imagine a cross between Guy Ritchie's Revolver, Nicholas Winding Refn's last couple of films and the heyday of Seijun Suzuki, you might be able to glimpse an idea of what lies in store but frankly there's never been anything like this before. Love it or hate it, there's no denying that this future camp cult classic is the 'real' deal. "Real" would be more appreciated to most western film viewers tbh, Koreans have a "type" and a lot of "Good" Korean Films are honestly average if you are more open minded & objective. Y'know, my favorite Korean screenwriter somehow came up with ATTACK ON THE PIN-UP BOYS, where members of a boy band compete to get splattered with human dung, so...I can't judge. Very interesting about the producer taking over directing duties (something that I believe is strictly forbidden in Hollywood films by the Director's Guild). If it's a failure, at least it's an ambitious one. Which ones? No sarcasm, curious, which are these you talk about. Most of the more drama/kpop mainstream types. Been a long time since I've watched the movies. The movies for me, often have bad pacing either too fast or too slow. Their smaller films are almost always better but its usually rated lower than their "Good ones" and its understandable. is there a western release of this? or a way to see it with English subtitles? If you mention drama/kpop, i'll assume you're quite young. South Korea has an incredibly strong film output. Big & small. Drama as in the Film Genre, KPop as in Mainstream, manufactured type Films (No real word to explain it. "strong film output. Big & small"
Quantity does not equate to Quality. I think by "strong output", he meant "good guality", not "a large quantity." strong output usually refers to vast quantity iirc. Not in Saul's context, which was my point. And no, it doesn't. Not when your point is "Quantity does not equate to Quality"
How do you "know" the context? Its your own interpretation. And Yes. More doesn't mean better.